The Diono Super Mat protects your automobile seat upholstery from the permanent indentations caused by a child safety seat. With individual panels of high-density foam, the Super Mat will contour to your vehicle's seat while the non-slip surfaces on both the top and bottom prevent slipping of the child safety seat. Included is a front organizer pocket to keep essentials handy. Compatible with all infant carriers, car seats and booster seats, including those with the latch system of attachment. OVERALL PROTECTION: The Car Seat Super Mat has been crafted with Flexlock to help grip both the car seat and your upholstery to prevent slipping. The pad is made with Pentalock, five carefully constructed layers to prevent wear and tear. Each mat is also waterproof to help protect against accidents and spills. FRONT POCKET FOR EASY STORAGE: The Super Mat features three mesh covered pockets to help keep your car organized. Your child can easily access the pockets to grab their favorite book or snack while you drive. LATCH AND UAS COMPATIBLE: The Super Mat is designed to work with seat belt and LATCH installations to help provide the best safety possible for your child. The mat is suitable for all infant carriers, car seats, and boosters meaning you can use it continually as your child grows. Drive with peace of mind knowing the Super Mat will help keep your child right where they need to be. MAKES AN EXCELLENT GIFT: Finding the right gift for expecting parents can be hard, but Diono has something for everyone! 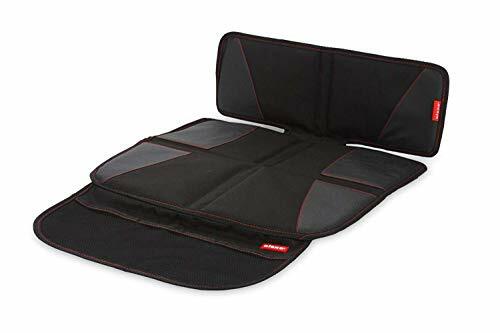 The Diono Car Seat Super Mat makes an excellent gift for those parents who are always living life on the go. Whether it's their first child or their next, trust Diono to make the perfect shower or birthday gift.